[Translate] Tienanmen Square Back in September, my family and I went to Beijing, China for a week. We had an amazing time at the capital city from shopping for teas and souvenirs, sightseeing the landmarks like Tienanmen Square, Temple of Heaven, and a day trip to The Great Wall of China. We stayed at the gorgeous, luxurious Grand Hyatt Beijing that was in the heart of the city and in walking distance to the main attractions like Tienanmen Square. The public transportation is very efficient and clean (unlike New York City). We also ate very well. We had very good..
[Translate] When mt family and I were traveling in Beijing, we stayed at the fabulous and centrally located Grand Hyatt Beijing (北京东方君悦大酒店). This hotel has 825 rooms and Suites with a view of Chang An Avenue (one of the major streets in Beijing) or has a Courtyard View. It’s right next to Wangfujing shopping street and connected to a huge and luxurious Beijing Oriental Plaza commercial complex. 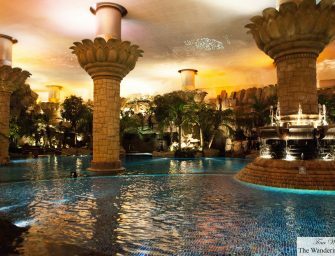 The Club Oasis has a 55-meter (180.45 feet) indoor swimming pool that’s fashioned to look and feel like a jungle with its humidity. There’s also a 24-hour fitness center and a spacious heated..
[Translate] Okra is one of those few restaurants in Beijing where you have to find your way to your meal. Not too far fetched like going to Temple Restaurant Beijing (TRB) but instead of walking down the somewhat sketchy, old school hutong, you would be walking around a maze of slick glass, steel and concrete skyscrapers that look like corporate businesses. When you do find a security guard right outside sitting on a corner of an entrance to a walled entrance to what may be another cluster of buildings, that is where you should be — The 1949 Hidden City..